On October 19th in Dallas, the Komen Race for the Cure had more over 20,000 participants gathered outside NorthPark Center to join the Saturday morning 5k and Survivors walk. This annual event has grown over the years with the first occurring 31 years ago with 800 people. 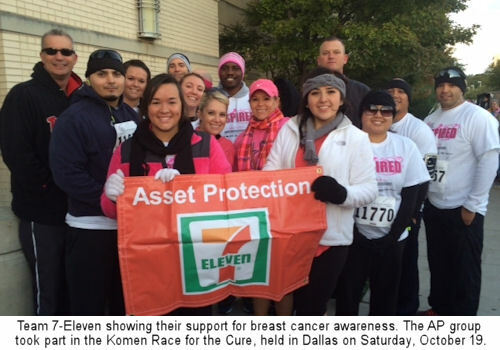 The 7-Eleven Corporate Asset Protection Team members joined the event with several family members for the 5k and Survivors walk. The 7-Eleven AP Team has had the “let’s get involved in our communities” approach in 2013 and they are looking forward to events scheduled in the future. In November, many team members will be volunteering at The Soup Mobile, a mobile soup kitchen in the Dallas area that has been feeding the homeless for more than a decade. Make an effort to get your teams involved in your communities!